Meet Lagertha Lothbrok, a Famous Viking Warrior Queen. We have all the Viking Women’s & Men’s Costumes from the Historical Vikings, Movie Vikings or Vikings from any TV Series. We also have any Legendary, Literary or Fictional Viking Characters Outfits you can imagine. 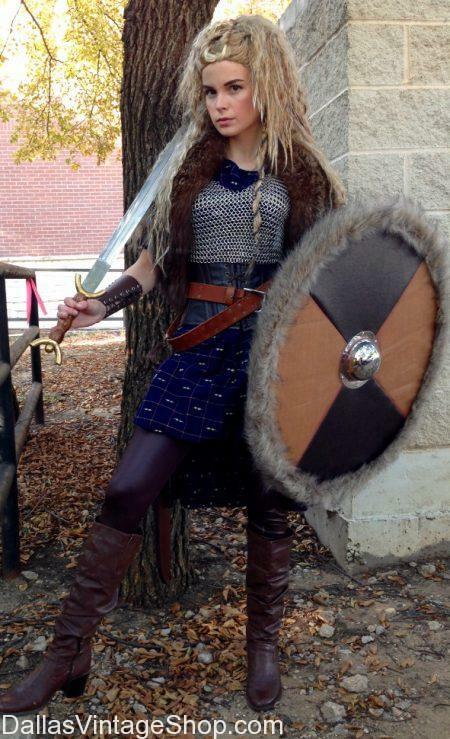 We have the best quality and the largest selection of Ladie’s & Men’s Viking Costumes in the Dallas Metroplex. We even have excellent Wigs, Weapons, Armor, Jewelry and other accessories you need for any Viking Costume imaginable. Get Theatrical Vikings Wardrobes or Children’s School Project Viking Outfits. Need Renaissance or Medieval Festival Garb or Supreme Quality Viking Costumes? We have what you need. Find Supreme Quality Theme Parties or Halloween Party Viking Costumes. We have even provided Incredible Outfits for Viking Weddings. This entry is filed under Vikings. You can follow any responses to this entry through the RSS 2.0 feed. Both comments and pings are currently closed.